I usually do a recap of the fashion of the Golden Globes since it is pretty much the first red carpet event of the movie year but this year I thought I would do something different. 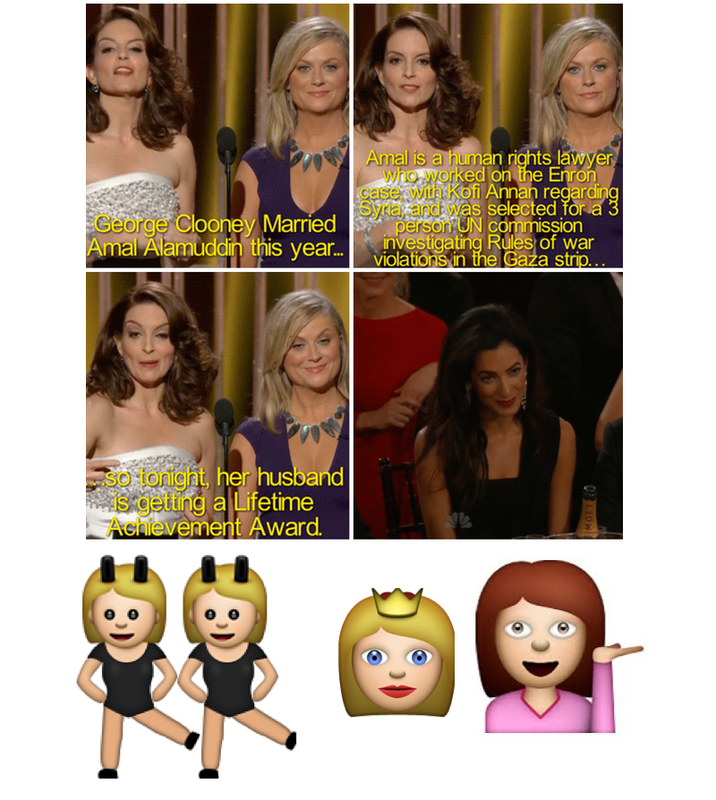 Not that I didn't think the fashion was "all that" ( I mean, Kate Hudson and Amy Adams hello) but there were some pretty fun, sweet and emotional moments in the awards show that I thought I would highlight... but how to highlight these moments, without doing the same post everyone else is doing... emojify it! OK, I am sure if you were live tweeting the awards show, you must have seen the following tweet, which by the by, made me legitimately laugh out loud. 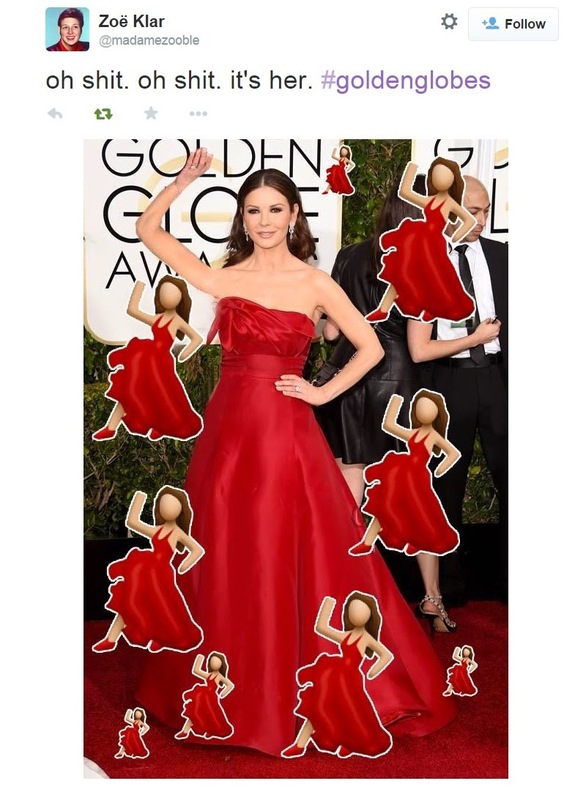 A lover and avid user of emojis, Katherine Zeta Jones' bent back arm? Everything. 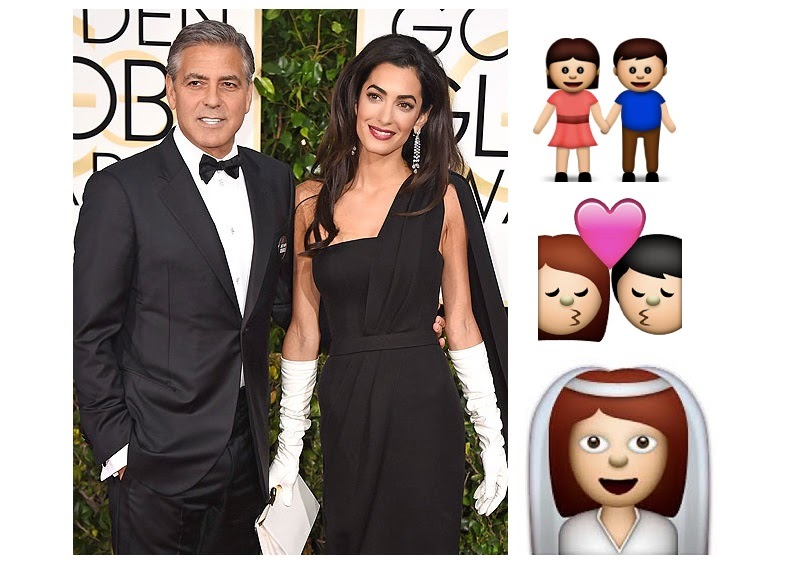 Here are some of the night's best moments, as depicted in emojis. First "Must Watch" and simultaneously cringe-worthy moment on the E! red carpet was Guiliana Rancic asking Amal and George Clooney to do a shot of his "smooth" alcohol. "Is is as smooth as you say?" 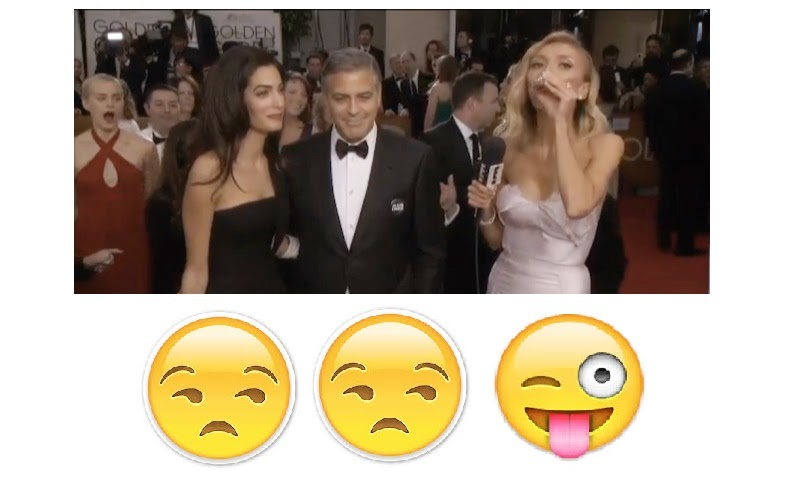 The whole bit was so embarrassing to watch as Amal and George not so politely stare at Guiliana taking a shot of booze on the red carpet. E! probably thought that this would go down differently, I'm sure... but alas, it did not. One of Amy Poehler and Tina Fey's opening jokes was a humdinger, aimed right at George and Amal. I want to believe that they broke Amal down with this joke and that her laughter was genuine, because George certainly thought it was funny... but that Amal, she's a tough nut to crack. Then there was the whole George professing his love to Amal in his acceptance speech for the Lifetime Achievement Award. Like, happy tears, streaming down my face because Love Rules at the Looohuuuve Shack... and I almost believe that Amal has a heart because she seems touched by his public proclamation of his love for her. And it wasn't all about George and Amal,though it did seem like it for parts of the night. 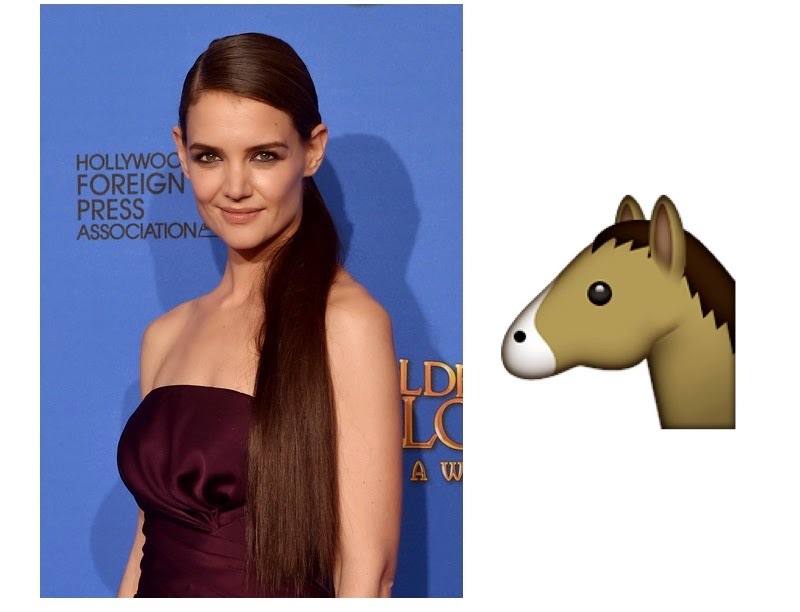 Katie Holmes' pony tail was ALL pony. There was Kate Hudson looking like every.thing in that tight fitting Versace number. There was Amy Adams acceptance speech where she thanked women for being so inspiring. Then Maggie Gyllenhal upped the ante by seeing her girl power and raising her a real woman power... Fist pump. In a night full of "upsets", I was most upset by The Lego Movie losing to How to Train Your Dragon 2 (not even the first one!). As my friend Molly said, "Everything is not awesome." Speaking of everything not being awesome, nearly every single person at the Golden Globes was sweating their asses off, in a very noticeable way. Apparently, the AC was off at the Hilton... and apparently, celebs are people too, people with sweat glands and T-zones. What were some of your Fave moments from the Globes? Great recap! I loved Kate Hudson's dress too... but I wish her hair was different, I didn't love the middle part. I loved Jessica Chastain's look overall, as well as Amy Adams. Great recap! Also globes moment that is great idea.